Send flowers to celebrate every occasion! The beautiful pink feelings for you bouquet is a stunning gift to send for a birthday, anniversary or to say get well. 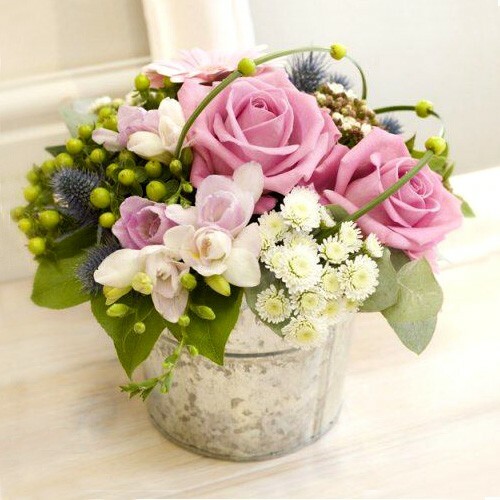 Arranged with fresh flowers including a pink blend of roses, pom-poms and wild flowers all placed gracefully in a nice pot. Note: Flowers and pot might change depending on availability. So, you need exquisite bouquets, a fanatic customer support and 100% satisfaction guarantee? Great, you're one click away from sending smiles. We deliver to Beirut and all of Lebanon. Copyright 2019 FlowersToLebanon.com part of FlyingRoses.com. Free delivery to Beirut and major areas. Lebanon is one of the most amazing countries in the Middle East as far as its nature and climate. Is is the only country in the area that does not have a desert. Lebanon boasts a mild climate which allows it to be home to a diverse assortment of flowers and plants. You can find all types of flowers and plants, up to 3,000 species! Some local Lebanese flowers are Eunomia oppositifolia, Origanum libanoticum, and Hyacinth. There are some flowers which can be found in abundance in Lebanon but are not native to the country, such as Begonia, Cactus, Dahlia, Gerbera, Red eye, and Jasmine. Unfortunately, since some flowers are seasonal, Lebanon does not always have an abundance of these flowers so sometimes they have to be imported into the country. An example of this is red roses which are imported into Lebanon during the winter, that is when ordering online you will notice higher rates than summer time. Flowers in Lebanon are beautiful and scattered all across the country. Most people even have special flower gardens planted by their houses in order to enjoy the beautiful colors and scents.